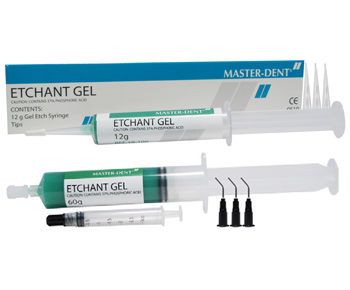 Master-Dent® Green Gel Etch offers a sophisticated 37% phosphoric acid formulation containing wetting agents, easily soluble thickeners and FDA certified dye. It is easy to apply and to control etched areas, as well as easy to rinse off. Dispensing system is precise and simple, thus preventing the possibility of contamination and waste. The economy size 12 gram package is priced to allow substantial savings and the 60 gram saves even more.